Do you ever find yourself in the kitchen, confused and full of questions? What is this that I’m making? Why did I start so late? How will I possibly finish making it before I have to go pick up the kids? Do I even want to? Shouldn’t there be some liquid in here? 2 hours in the oven? Maybe we should just eat hummus for dinner? Who wrote this recipe? Why didn’t they give me a picture? Am I lame to want a picture? If I were fabulous and French would I understand it? Should this cabbage be cooked all the way through? Maybe I should have cut it before I blanched it? Will my children touch this? Will Joey grumble about cabbage week all through dinner? Will I have to skip a day of cabbage week and keep this one to myself? And then, even though I have about ten minutes to pull this together, I have to stop and take a picture. It turns out this whole cabbage week might just be an excuse to take a lot of pictures of cabbage, perhaps, I’m beginning to think, the most photogenic vegetable there is. 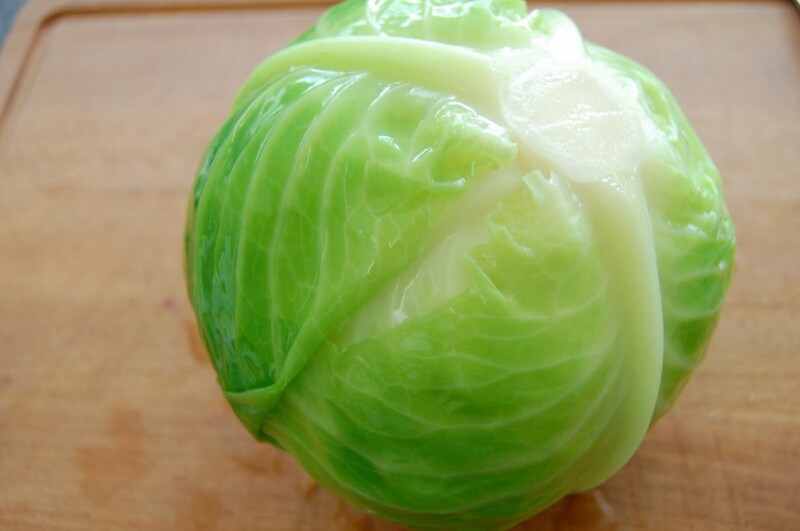 Tell me this, have you ever seen anything more lovely than a whole blanched cabbage? I swear, I would make a dress out of the leaves if people wouldn’t complain about my perfume. Look at that color, would you? Like life itself, that color. Just gorgeous. I wanted to make something new for you today, something I’ve never tried. 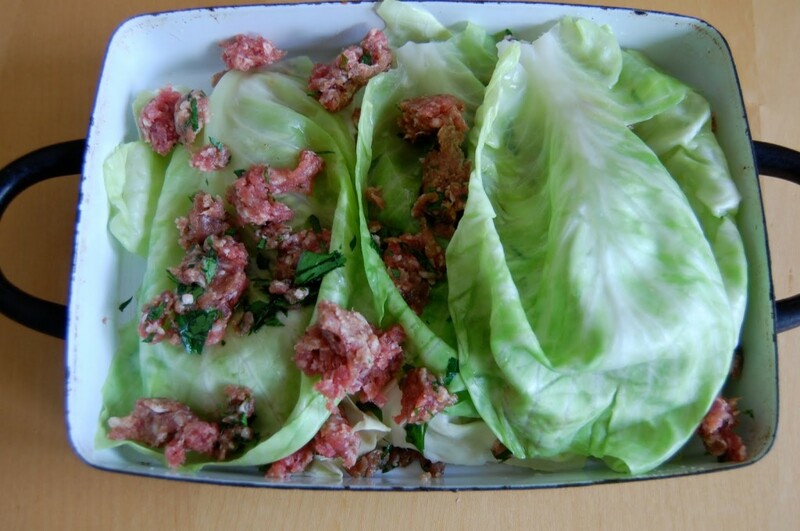 I wanted something fancy and interesting involving whole cabbage leaves and meat and cognac. Today is stuffed cabbage. I’m finding that to say you are making stuffed cabbage is as specific as saying that you are making a pasta dish. Sometimes the actual whole cabbage is stuffed. Sometimes the leaves are rolled around the stuffing and you have cabbage rolls. Or every so often, as in this confusing dish, the leaves are layered with the stuffing. Sometimes the stuffing is meat. Sometimes there is rice. Sometimes there are vegetables. I had to narrow down the category. For stuffed cabbage inspiration, I kept wanting to come back to my new and satisfyingly hip book, I Know How to Cook. I’ve talked about this book a few times since my friend Alice sent it to me for my birthday, and it continues to make me feel fancy just by holding it in my hands. It’s a new version of an old book of generally simple and classic French cooking, and it’s one of those books that is a mix of useful and timeless recipes along with weird old recipes that you would never want to try but love to look at. I know there are these two categories, because I heard it on NPR, but because everything usually sounds like a good idea to me, I can’t really seem to tell the difference. I’m just as likely to attempt the “gayettes” (if only I could find the requisite pig’s liver, lungs, kidneys, and caul) as I am to make the timeless “coq au vin”. As I layered cognac soaked meat onto whole cabbage leaves, I started to think that I might have made a mistake. But in my thirty-one years I have yet to abandon a recipe, so I soldiered on. In the end, I’m really not sure if I made this the way it was intended. People must have been more intelligent in 1932 when the book was first published. They must have just inherently known whether one would cut a cabbage before blanching or not. My confusion continued to lead me through the whole process, and in the end, it seemed outstandingly simple. Cabbage, meat, breadcrumbs. I was instructed to top it off with tomato sauce, and I whipped up a batch of this, which would be good on absolutely anything. 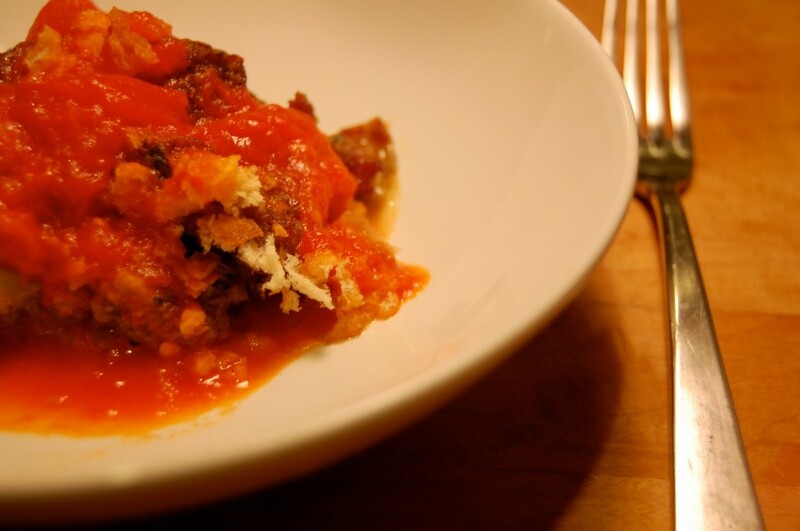 I know it’s cabbage week and all, but make this tomato sauce, even if it’s only to pour over your cabbage. All was well in the end. I thought it was quite tasty, and enjoyed my small square of stuffed cabbage from the corner of the baking dish. Joey however, ate the entire rest of the contents of the pan, save for the few bites that Sadie sampled. He was quiet, and sighed a lot, and he closed his eyes for the greater part of the dinner. This is amazing, he said. And with that, Joey embraced cabbage week. Bring a large pot of salted water to boil. Preheat the oven to 325 degrees. Remove any of the damaged outer leaves from the cabbage and trim the bottom stem, removing as much as possible while keeping the cabbage together. (If you know a better way to prepare cabbage for blanching the whole leaves, by all means do it, and teach me how too). Submerge the cabbage in boiling water. It will float, so hold it down with a serving spoon. Cook it for about 5 minutes, and then submerge in ice water. Separate the leaves of the cabbage from the stem and set aside. 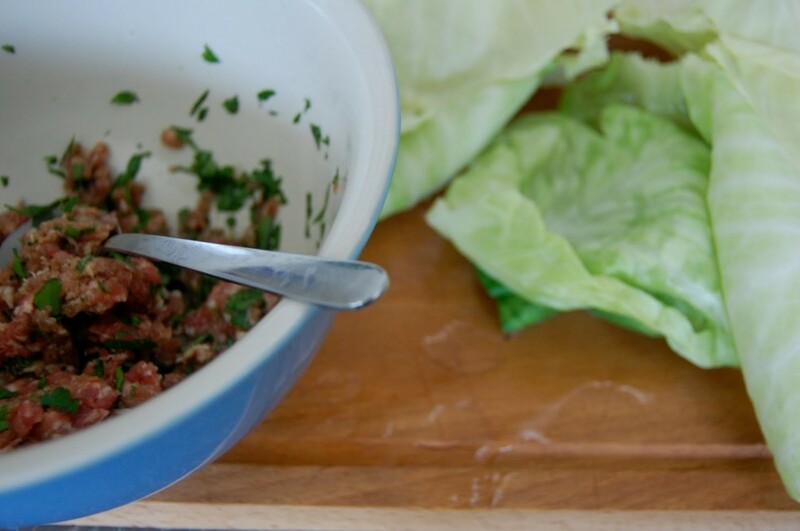 In a medium bowl, combine the ground sausage, cognac, parsley, salt and pepper. In an ovenproof casserole dish, lay out a layer of cabbage leaves. Then a layer of stuffing. Repeat until you have run out of stuffing. End with a layer of stuffing, and then all of the breadcrumbs. Pour the 1/4 cup water or stock over the whole thing. Cover with tin foil and put in the oven. Bake for one hour, then remove the tin foil and bake one hour more. Serve topped with tomato sauce. I stumbled upon your book at the library, and I loved it! I am a busy mom of 3 children (10, 11 and 12) and I too like to diy in the kitchen as you do, time permitting of course! Now, instead of reading at night before bed as I normally do, I am perusing your website. I enjoy reading your stories about your family, as much as I love the recipes. I just wanted to comment on your stuffed cabbage. It looks yummy!! When my mom used to make cabbage rolls (she made some of the best) she often added a layer or two of sauerkraut. Not a lot, just enough for a bit of flavour. I thought that you might like to try that as I see you have made your own sauerkraut. Thank you for your recipes, (I really want to try making my own mozza and ricotta) and your stories. You are an amazing writer. Thank you, Jennifer, and thank you for saying hello! And I find sauerkraut added to anything is a good idea, so I’m definitely game.